"Giambellino" redirects here. For the district of Milan, see Giambellino-Lorenteggio. Giovanni Bellini (Italian pronunciation: [dʒoˈvanni belˈliːni]; c. 1430 – 26 November 1516) was an Italian Renaissance painter, probably the best known of the Bellini family of Venetian painters. His father was Jacopo Bellini, his brother was Gentile Bellini (who was more highly regarded than Giovanni during his lifetime, although the reverse is true today), and his brother-in-law was Andrea Mantegna. He was considered to have revolutionized Venetian painting, moving it towards a more sensuous and colouristic style. Through the use of clear, slow-drying oil paints, Giovanni created deep, rich tints and detailed shadings. His sumptuous coloring and fluent, atmospheric landscapes had a great effect on the Venetian painting school, especially on his pupils Giorgione and Titian. Giovanni Bellini was born in Venice. He was brought up in his father's house, and always lived and worked in the closest fraternal relation with his brother Gentile. Up until the age of nearly thirty we find in his work a depth of religious feeling and human pathos which is his own. His paintings from the early period are all executed in the old tempera method: the scene is softened by a new and beautiful effect of romantic sunrise color (as, for example, in the St. Jerome in the Desert). In a changed and more personal manner, he drew Dead Christ pictures (In these days one of the master's most frequent themes e.g. Dead Christ Supported by the Madonna and St. John, or Pietà). with less harshness of contour, a broader treatment of forms and draperies and less force of religious feeling. Giovanni's early works have often been linked both compositionally and stylistically to those of his brother-in-law, Andrea Mantegna. In 1470 Giovanni received his first appointment to work along with his brother and other artists in the Scuola di San Marco, where among other subjects he was commissioned to paint a Deluge with Noah's Ark. None of the master's works of this kind, whether painted for the various schools or confraternities or for the ducal palace, has survived. Christ Blessing, 1500; Tempera, oil, and gold on panel; Kimbell Art Museum, Texas. To the decade following 1470 must probably be assigned the Transfiguration now in the Capodimonte Museum of Naples, repeating with greatly ripened powers and in a much serener spirit the subject of his early effort at Venice. Also the great altar-piece of the Coronation of the Virgin at Pesaro, which would seem to be his earliest effort in a form of art previously almost monopolized in Venice by the rival school of the Vivarini. As is the case with a number of his brother, Gentile's public works of the period, many of Giovanni's great public works are now lost. The still more famous altar-piece painted in tempera for a chapel in the church of S. Giovanni e Paolo, where it perished along with Titian's Peter Martyr and Tintoretto's Crucifixion in the disastrous fire of 1867. After 1479–1480 much of Giovanni's time and energy must also have been taken up by his duties as conservator of the paintings in the great hall of the Doge's Palace. The importance of this commission can be measured by the payment Giovanni received: he was awarded, first the reversion of a broker's place in the Fondaco dei Tedeschi, and afterwards, as a substitute, a fixed annual pension of eighty ducats. Besides repairing and renewing the works of his predecessors he was commissioned to paint a number of new subjects, six or seven in all, in further illustration of the part played by Venice in the wars of Frederick Barbarossa and the pope. These works, executed with much interruption and delay, were the object of universal admiration while they lasted, but not a trace of them survived the fire of 1577; neither have any other examples of his historical and processional compositions come down, enabling us to compare his manner in such subjects with that of his brother Gentile. Of the other, the religious class of his work, including both altar-pieces with many figures and simple Madonnas, a considerable number have been preserved. They show him gradually throwing off the last restraints of the Quattrocento manner; gradually acquiring a complete mastery of the new oil medium introduced in Venice by Antonello da Messina about 1473, and mastering with its help all, or nearly all, the secrets of the perfect fusion of colors and atmospheric gradation of tones. The old intensity of pathetic and devout feeling gradually fades away and gives place to a noble, if more worldly, serenity and charm. The enthroned Virgin and Child (such as the one at left) become tranquil and commanding in their sweetness; the personages of the attendant saints gain in power, presence and individuality; enchanting groups of singing and viol-playing angels symbolize and complete the harmony of the scene. The full splendour of Venetian color invests alike the figures, their architectural framework, the landscape and the sky. An interval of some years, no doubt chiefly occupied with work in the Hall of the Great Council, seems to separate the San Giobbe Altarpiece, and that of the church of San Zaccaria at Venice. Formally, the works are very similar, so a comparison between serves to illustrate the shift in Bellini's work over the last decade of the 15th century. Both pictures are of the Holy Conversation (sacred conversation between the Madonna and Saints) type. Both show the Madonna seated on a throne (thought to allude to the throne of Solomon), between classicizing columns. Both place the holy figures beneath a golden mosaicked half dome that recalls the Byzantine architecture in the basilica of St. Mark. In the later work Bellini depicts the Virgin surrounded by (from left): St. Peter holding his keys and the Book of Wisdom; the virginal St. Catherine and St. Lucy closest to the Virgin, each holding a martyr's palm and her implement of torture (Catherine a breaking wheel, and Lucy a dish with her eyes); St. Jerome, with a book symbolizing his work on the Vulgate. Stylistically, the lighting in the San Zaccaria piece has become so soft and diffuse that it makes that in the San Giobbe appear almost raking in contrast. Giovanni's use of the oil medium had matured, and the holy figures seem to be swathed in a still, rarefied air. The San Zaccaria is considered perhaps the most beautiful and imposing of all Giovanni's altarpieces, and is dated 1505, the year following that of Giorgione's Madonna of Castelfranco. 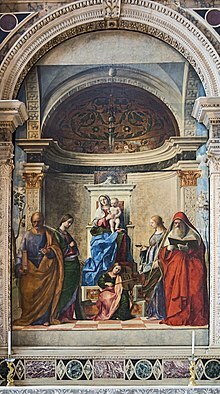 Other late altarpiece with saints include that of the church of San Francesco della Vigna at Venice, 1507; that of La Corona at Vicenza, a Baptism of Christ in a landscape, 1510; and that of San Giovanni Crisostomo at Venice of 1513. Of Giovanni's activity in the interval between the altar-pieces of San Giobbe and San Zaccaria, there are a few minor works left, though the great mass of his output perished with the fire of the Doge's Palace in 1577. The last ten or twelve years of the master's life saw him besieged with more commissions than he could well complete. Already in the years 1501–1504 the marchioness Isabella Gonzaga of Mantua had had great difficulty in obtaining delivery from him of a picture of the Madonna and Saints (now lost) for which part payment had been made in advance. In 1505 she endeavoured through Cardinal Bembo to obtain from him another picture, this time of a secular or mythological character. What the subject of this piece was, or whether it was actually delivered, we do not know. Albrecht Dürer, visiting Venice for a second time in 1506, describes Giovanni Bellini as still the best painter in the city, and as full of all courtesy and generosity towards foreign brethren of the brush. In 1507 Bellini's brother Gentile died, and Giovanni completed the picture of the Preaching of St. Mark which he had left unfinished; a task on the fulfillment of which the bequest by the elder brother to the younger of their father's sketch-book had been made conditional. In 1513 Giovanni's position as sole master (since the death of his brother and of Alvise Vivarini) in charge of the paintings in the Hall of the Great Council was threatened by one of his former pupils. Young Titian desired a share of the same undertaking, to be paid for on the same terms. Titian's application was granted, then after a year rescinded, and then after another year or two granted again; and the aged master must no doubt have undergone some annoyance from his sometime pupil's proceedings. In 1514 Giovanni undertook to paint The Feast of the Gods for the duke Alfonso I of Ferrara, but died in 1516. He was interred in the Basilica di San Giovanni e Paolo, a traditional burial place of the doges. St. Francis in Ecstasy, 1480; oil and tempera on panel; Frick Collection, New York. Both in the artistic and in the worldly sense, the career of Bellini was, on the whole, very prosperous. His long career began with Quattrocento styles but matured into the progressive post-Giorgione Renaissance styles. He lived to see his own school far outshine that of his rivals, the Vivarini of Murano; he embodied, with growing and maturing power, all the devotional gravity and much also of the worldly splendour of the Venice of his time; and he saw his influence propagated by a host of pupils, two of whom at least, Giorgione and Titian, equalled or even surpassed their master. Giorgione he outlived by five years; Titian, as we have seen, challenged him, claiming an equal place beside his teacher. Other pupils of the Bellini studio included Girolamo Galizzi da Santacroce, Vittore Belliniano, Rocco Marconi, Andrea Previtali and possibly Bernardino Licinio. In the historical perspective, Bellini was essential to the development of the Italian Renaissance for his incorporation of aesthetics from Northern Europe. Significantly influenced by Antonello da Messina and other contemporary trends of the time, such as oil painting, Bellini introduced the pala, or single-panel altarpieces, to Venetian society with his work Coronation of the Virgin. Certain details in this piece, such as breaks in the modeling of figures and shadows, imply that Bellini was still working to master the use of oil. This painting also differs from previous Coronation scenes as it appears as a "window" to a natural scene, and excludes the typical accompanying Paradise hosts. The simple scenery allows viewers to relate with more ease to the scene itself than before, reflecting Alberti's humanist and inventio concepts. He also utilized the disguised symbolism integral to the Northern Renaissance. Bellini was able to master the Antonello style of oil painting and surface texture, and use this new skill to create a refined and distinctly Venetian approach to painting. He blends this new technique with Venetian and Byzantine traditions of iconography and color to create a spiritual theme not found in Antonello's pieces. The realism of oil painting coupled with the religious traditions of Venice were unique elements to Bellini's style which set him apart as one the most innovative to Venetian Renaissance painting. As demonstrated in such works as St. Francis in Ecstasy (c. 1480) and the San Giobbe Altarpiece (c. 1478), Bellini makes use of religious symbolism through natural elements, such as grapevines and rocks. Yet his most important contribution to art lies in his experimentation with the use of color and atmosphere in oil painting. The Bellini (cocktail) is named in his honor. ^ Luciano Canepari. "Giovanni". DiPI Online (in Italian). Archived from the original on 21 October 2018. Retrieved 19 October 2018. ^ Luciano Canepari. "Bellini". DiPI Online (in Italian). Archived from the original on 21 October 2018. Retrieved 19 October 2018. ^ "The Barber Institute of Fine Arts, the Lapworth Museum of Geology and the University of Birmingham Collections – Objects". Mimsy.bham.ac.uk. 23 July 1948. Archived from the original on 23 March 2012. Retrieved 26 January 2013. ^ "The Feast of the Gods". Nga.gov. 9 January 1942. Archived from the original on 1 February 2013. Retrieved 26 January 2013. ^ Stephen J. Campbell and Michael W. Cole, Italian Renaissance Art. (New York, New York: Thames and Hudson Inc., 2012), 239-244. ^ John T. Paoletti and Gary M. Radke, Art in Renaissance Italy. (Upper Saddle River, NJ: Pearson Prentice Hall, 2012), 322-326. Oskar Batschmann, Giovanni Bellini (London, Reaktion Books, 2008). Rona Goffen, Giovanni Bellini (Yale University Press, 1989). Wikimedia Commons has media related to Giovanni Bellini. Giovanni Bellini in "A World History of Art"